Surprise Saturday: I’m Doing Camp NaNoWriMo July 2017! Hey, everybody! I’m back again! I can’t seem to stay away (lol). But it’s for good news, I swear. 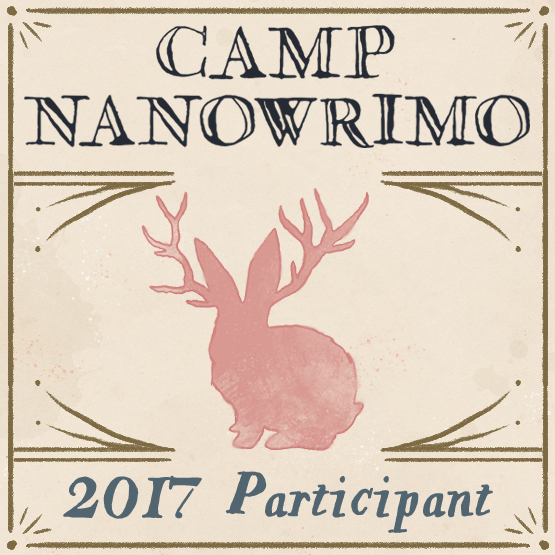 I’m participating in Camp NaNoWriMo for July 2017! What’s Camp NaNoWriMo, you ask? It’s a lot like NaNoWriMo, but instead of requiring 50,000 words minimum to complete it, you can set your own word count goals. Plus, it being July, you have 31 days instead of 30. Oh, and you can be in a virtual cabin with 19 other writers for a total of 20 writers, if you count yourself. Anyway, I joined because I think I’ve finally put together the outline for my book KARETU and the other side stories to go with it. I was planning on getting back into the writing groove, anyway, but I decided to spice things up by tying it to Camp NaNoWriMo, trying to meet fellow writers, roast virtual marshmallows, and see how it goes. If you happen to be participating, let me know. I’d love to hear from you. PreviousFlash Fiction Friday: Where Do Hummingbirds Go to Sleep?